This piece was an exploration in materials designed and fabricated for the Design Trust for Public Space Annual Auction. The project requirements were: to create a “nest”--something that could support residence for a creature, and would fit in a taxi. The auction was intended to raise money for a handful of public projects sponsored by the Design Trust and featured the work of a variety of artists and architects, including: Christo, Kiki Smith, Isaac Mizrahi, Lewis Tsurmaki Lewis, Hariri & Hariri, Tsao & McKown, etc. Our design is for a modern, indoor dog lounge or PUP TENT. 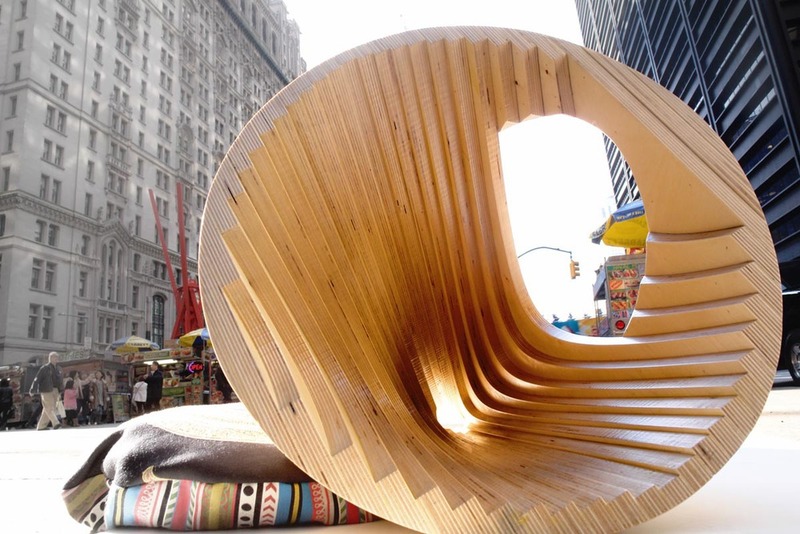 Water-jet cut plywood was laminated to create a conical shape. The exterior surface was sanded and finished smooth and the interior maintains the stepping configuration characteristic of the plywood lamina. A surface pattern is created as the planar plies of the wood intersect with the conical geometry of the surface. The design is sustainable as well as the configuration promotes the stack effect and the skylight and window provide natural light!